Known by many as the matriarch of the Bush family, Mrs. Bush was always there to support and defend her husband and children when criticized. Besides being only the second first lady to have both a husband and son be president, Mrs. Bush was also the mother of six children, George, Jeb, Marvin, Neil, Dorothy, and Robin who passed away of leukemia at the age of three in 1953. Karl Rove, President George W. Bush’s deputy chief of staff, wrote in a Wall Street Journal article that “the children she raised are testimony to a mother who taught respect, integrity, hard work and faith and gave unconditional love.” When Mrs. Bush passed away she and President Bush had been married for 73 years, the longest-married couple in U.S. presidential history. 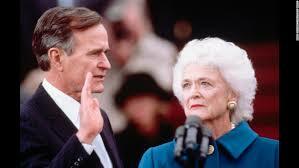 She married President Bush in 1945 when she was just 19 and he was 20. She is survived by her 93-year-old husband, five children, fourteen grandchildren, and seven great-grandchildren. The American people will be able to visit Mrs. Bush when she lays in repose between noon and midnight on Friday, April 20th in St. Martin’s Church in Houston, and a private funeral service will take place on Saturday, also at St. Martin’s Church. First Lady Melania Trump as well as former Presidents Barack Obama and Bill Clinton and former First Ladies Michelle Obama and Hillary Clinton will be attending the Saturday funeral service. Former President and First Lady Jimmy and Rosalynn Carter will not be able to attend because he is on an overseas trip and she is recovering from a recent intestinal surgery. President Donald Trump will not be attending the service “to avoid disruptions due to added security, and out of respect for the Bush Family and friends attending the service” according to the White House. Mrs. Bush will be buried in a family plot beside her late daughter Robin at the George Bush Presidential Library and Museum near Texas A&M University in College Station, Texas.